The Cole home of timber frame construction, red cedar shingles and white Wisconsin pine interior, had its carpets all woven in New York to fit the floors. Mrs. Cole [Elizabeth/ Eliza], an artist, designed landscaped gardens to surround the home. Elizabeth was apparently a bit feisty; she would ride down Main Street on a white charger. Later the Coles sold this home and built another at 910 Clyman Street. The second floor ballroom, now a five room apartment, was used for entertaining, dancing and lectures. Subsequent owners who also occupied the home after the Coles were the Joseph Salicks, the Ulrich Habheggers, the junior Ferdinand Hartwigs, Ray Franz, and for the past 30 years, Mr. and Mrs. Jerome Schultz. Joseph Salick used to row his boat down the Rock River every morning to near his Main Street store. Mrs. Sam Luchsinger, a Salick granddaughter, relates her grandmother used to tell of the gala balls they had on the second floor. Mrs. Habhegger, when she lived there, kept a Swiss cow bell in the cherry orchards with a cord to the pantry window so she could keep the birds from the makings of cherry pies. Mrs. Hartwig was a Habhegger daughter. It has been our fortune thus far through life to struggle with its stern realities, to the almost entire neglect of the beautiful and ornamental in Nature and Art, for which we have a kind of crude, instinctive taste. We cherish a strong love for artistic excellence in the cultivation of trees, shrubbery and flowers, that adorn the well planned yard and garden—where the beautiful shade trees and sweet odor of the flowers conspire to render home endearing and delightful. We have often envied the wealth of some people who use it only for the sordid gratification of selfish ambition, that we might be able to gratify our fancy in adorning “Our Home,” where we could recline at twilight hour and be fanned by the gentle breeze, laden with the rich fragrance of a thousand flowers, to listen to the music of the birds, the hum of the bees, and lulled to rest after the toils of the day in the contemplation of all the delightful associations which cluster around and render the “Home” happy. We had the pleasure a few days since of spending an hour in viewing the premises and residence of one or our oldest and much esteemed citizens, J. W. Cole, Esq. On entering we were kindly and cordially welcomed to view the internal arrangements of the splendid brick edifice erected about two years since, and as we passed from one spacious and elegantly furnished room to another, our admiration was heightened by the excellent taste manifested by Mrs. Cole in the arrangement of everything that seems to give a sort of welcome and easy air to chairs, sofas, tables, pictures, carpets, etc. It would be useless to attempt an adequate description of the house inside, but one room on the upper floor which we were shown contains various specimens of her handy work, in the shape of pictures, paintings, shell and crotchet work, and a great variety of ornaments, which renders Mrs. C. entitled to be enrolled on the list of artists. The walls are literally covered with specimens of her own making, evincing a refined and cultivated taste for the beautiful, and would richly repay any one for the trouble to visit them. Everything about the house seems arranged with a view of combining taste, convenience and economy, and her efforts in that direction, in our estimation, have been crowned with success. One the south side of the house projects a large octagon window that receives the concentrated rays of the sun upon a large variety of plants and flowers, arranged in little urns and boxes upon the shelves of a cone erected for that purpose, filling the room with their delightful fragrance. On entering the yard and garden we were struck with the mathematical skill displayed in the different curves, angles, circles, parallelograms, etc., observed in laying out the grounds, the whole forming a perfect system of inequalities and irregularities. The almost endless variety—numbering many hundreds—of trees, plants, flowers, shrubbery, etc., have all been planted within the last three years and exhibit the care and great labor bestowed in their cultivation and growth during so short a period. We are informed that the entire planning of the house and grounds have been under the direction and supervision of Mrs. Cole, and the whole is a monument of her intelligence, skill and perseverance. We could wish her better health and long life to enjoy the fruit of her labors thus far in making her home delightful and happy. Later, the Cole family, who owned a great amount of land in Watertown, occupied a fine house on Clyman Street (now no. 910) surrounded by vast acres of property. At the death of the son, Oscar, $86,000 from the Cole estate was turned over to the city of Watertown. Of this amount the Public Library was to receive half. $38,000 was put into the library addition, the balance, $5,000 was invested. The interest is used for children's books and a suitable book plate has been provided. At the time of the dedication of the John W. Cole Memorial addition in May 1930, all the flowers which had been presented in his honor were taken to Oak Hill Cemetery and placed on the Cole lot. One record stated that Mr. Cole sold the North Fourth Street house to a Mr. Stately, who in turn sold it to Mr. Joseph Salick. It has been impossible, so far, to verify this. For many years Mr. Joseph Salick had a jewelry store on Main Street next to the bridge. He used to row from the North Fourth Street house on the Rock River to his store. Mrs. Habhegger had trouble with the birds in the cherry trees. To keep them away a Swiss cow bell was hung in the tree, and a cord was passed through the pantry window. When Mrs. Habhegger went into the pantry she would pull the cord and scare the birds away. One of the children used to pick dandelions, at one cent per peach basket, and she gathered horse chestnuts under the tree on the south lawn. Even now the horse chestnut tree is a thing of beauty when in full bloom with its candle-like blossoms, and a green base of leaves. There was a large meadow, a fine spring, two garden houses, and shrubbery north and west of the house. Many picnics were held in the meadow. In the winter there was coasting, toward Rook River. There was a high board fence on the north in the early days. The knot holes afforded amusement to the children who loved to "peek." Bittersweet was planted around the south porch. Along the north side were beds of wild flowers: violets, Jack-in-the pulpits, trilliums, gentians, and maiden hair ferns. Under the west bedroom fragrant plants were planted, especially jasmine. Near the south porch there were many lilies of the valley, and at the rear of the house a double row of cherry trees. One of the most beautiful trees on the front lawn was an acacia, with its lacy white blossoms. On the side lawn at the south is a molted mass of iron that came from the great Chicago fire in 1871. Mr. Ulrich Habhegger's daughter, Elizabeth, married Ferdinand Hartwig, They lived in the home after the death of her parents. The house is owned at the present time by Mr. Ray Franz and his mother. In closing I should like to read this quotation: "A home stands apart from the stone and beams, slate and mortar that shelter it. It has an immortality which distinguishes it from temporal things. Like a stone it is marked by the human beings who possess it." 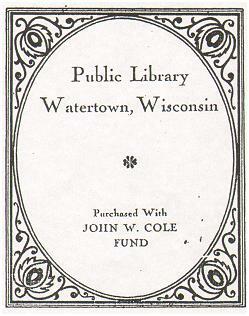 The History of Jefferson County, Wisconsin, 1879, gives the following short biography. John W. Cole was the third son of Ebenezer Cole. He was born December 28, 1814, in Charleston, Vermont. Until the age of 22, he worked upon the farm of his parents, and with his father at his trade of carpenter and joiner. In the fall of 1836, he started West, and first came to Milwaukee, where he remained until Jan. 1837, cutting timber on the Milwaukee River, when he moved to Watertown, making the trip with ox-teams, carrying flour (worth $20.00 a bbl) and pork ($40.00 a bbl). His brother Luther and five others lived four years in a cabin which they built and called it the "bachelor’s distress." Having dissolved partnership with his brother, Mr. Cole built a store on the north corner of Second and Main streets, and carried on a general merchandise business for about 15 years, part of this time being also engaged in the manufacture of saleratus and potash. In 1854 he built the block of stores on the southeast corner of Second and Main streets. In 1855 he held the office of Mayor of Watertown, and was also Supervisor of Jefferson County. John W. Cole married Eliza C. Fisk, daughter of James L. and Laura Fisk, of the state of New York, Nov. 19, 1844. They had three children, Oscar A., and two deceased, one named Johnnie, the other dying in infancy. Mrs. Cole was born Oct. 11, 1820. She came to Watertown as a bride accompanying her husband here from the East. She was one of the grand ladies of the city's early days and an expert horsewoman who rode each morning on her favorite mount, garbed in complete riding habit. Mr. Cole kept fine horses and was interested in the race track. Both Mr. and Mrs. Cole are buried in Oak Hill Cemetery. Mr. Cole died Feb.17, 1894. Mrs. Cole died Dec.12, 1898. In addition to the two graves of Mr. and Mrs. Cole there is recorded the names of Oscar A. Cole and Martha C. Cole. There are no dates. 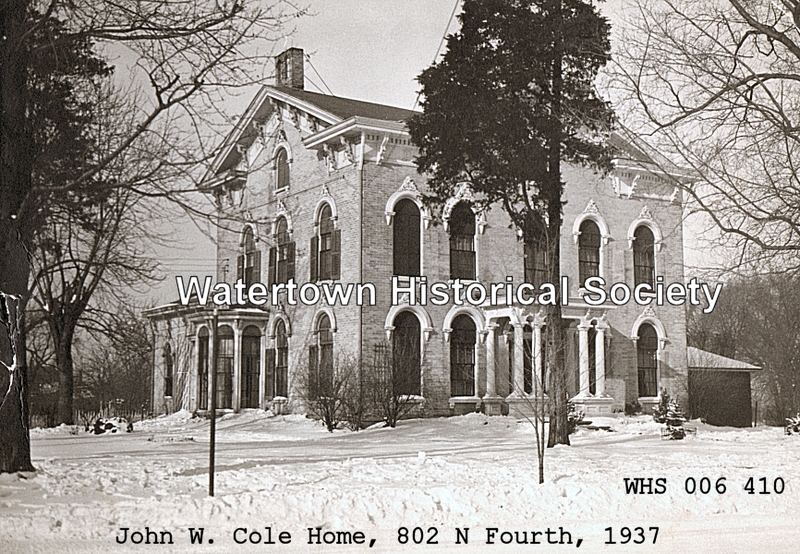 Mr. Cole, with his brother, Luther, opened the first store in Watertown in what is now Main Street, a small red building occupying the site of the present Bittner and Tetzlaff building. Main Street was then little more than a cow path. A funny thing about that early store was that the Cole brothers locked up during the day while they worked on a farm they owned in the northern part of Watertown, coming down only by special appointment to supply the needs of the customer. However, the store was open each night and that's when the biggest business was done. They handled everything from feed to household supplies. A son of John W. Cole, Oscar Cole, became one of the first owners of Tivoli Island. At this time it was called Concordia Island. It belonged to Mr. Jesse Decoy, a friend of Mr. Cole’s. Mr. Decoy said that if his friend ever had a son he would deed the island property to the boy. He kept his promise. Mrs. Cole said that "before the baby was 24 hours old she had the deed to this island, the beauties and loveliness of which we so much admire." John W. Cole built the house that now stands at 802 N. Fourth Street in the 1850's. The original estate on the north extended to the Gardiner home. The homes of Mrs. J. P. Roffeis and Ben R. Krueger on the north now occupy part of the property. On the west it extended to the house occupied by Arthur Kohls, 320 Green Street. The house is a timber frame construction, oak one to one and a half inches thick. The outside brackets are handmade. The shingles were red cedar. The walls are four bricks thick. The interior woodwork is White Wisconsin pine, the trim is grained. Around the windows it is ten inches wide. The baseboards are eleven inches high, and the ceilings on the second floor are 10 feet 10 inches. The upper floor of the house at the present time has five rooms. The living room, northeast; the dining room, north; the kitchen, north; a bedroom, southwest and one southeast. The living room, dining room and kitchen used to be the ballroom, with a platform for the musicians at the west. The southwest bedroom was the reception room, and the southeast bedroom the check room. 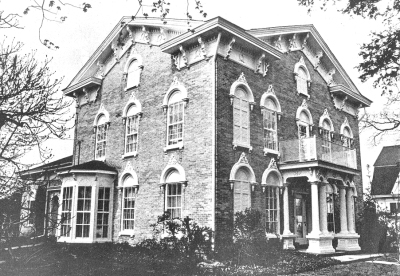 When the Salick family occupied the house the ballroom was used as two bedrooms. The lower floor had two living rooms, a dining room, four bedrooms, a kitchen and summer kitchen, and a large pantry. Mrs. J. B. Murphy in a letter to me March 20, 1939, says: "my parents were intimate friends of Mrs. Cole for many years. In those early days there were very few fine residences. As a small child I went with my parents when they visited the beautiful home. "Mrs. Cole was a woman of fine taste; while her husband was indifferent to those things that give delight to feminine tastes, he never opposed her in any way. Mrs. Cole was fond of flowers. She had a beautiful garden stocked with choicest plants. "The architecture of the house was never changed and is a model of good taste. The furniture and interior decorations were purchased in New York. The carpets were woven to fit the floors. The interior was spacious. The second floor had a large room especially fitted for entertainments, dancing, concerts, lectures, and even spiritualistic séances. As a child I was taught by my good mother never to handle things in other homes without their permission. This won for me certain privileges. I might amuse myself by watching the goldfish in the aquarium, or looking at myself in the high gold-framed mirrors. The Ruesch sisters have one of these mirrors, purchased when the Cole family disposed of their home and its contents. "One incident of my visits to the home as a small child is indelibly stamped on my memory. Oscar, their only child, was a young lad. His mother made him pop some corn, which he did, and brought it in from the kitchen in a large milk pan and presented it to me. I have never forgotten the feeling of humiliation that was mine when my mother told me it was not all mine!! "I am eager to see the interior of the old house. I never pass it without rejoicing that its exterior, at least, has never been changed. I shall want to visit the house while you are domiciled there."